Today, as I write, ‘We are illogical’, I have arrived in the sunny Okanagan Valley of British Columbia, Canada 🇨🇦. Throughout the fall and winter months you’ll find me feverishly writing science-fiction thrillers and assorted screenplays, such as BLACK ANGELS (ready for release) and short stories, like Android Alisha. But during the months of June, July and August, you’ll find me at my summer home, partaking in outdoor activities within our Canadian oasis, well known by celebrities across North American. In fact, as we speak, there’s a couple of filming crews setting up in Kelowna, BC. This may be the summer home for the rich and famous, but to me, it’s simply where I was raised as a kid. It’s indeed my home. For Canada 150 or your next vacation I highly recommend you take a visit to the sunny Okanagan Valley of British Columbia, Canada 🇨🇦. My creative art of writing can be referred to as the ‘Vincent Van Gogh art-impressionist-style’, left with secret hidden messages throughout each paragraph. Writing is an expression from my inner soul, hoping to make a difference to my readers, as they begin to explore the plots and twists behind my stories. Throughout my life I have questioned our reality. The how and why of our very existence is indeed intriguing, leading me to believe the possibilities of a higher intelligence far surpassing our own. I like to refer them as our ancestral GODS, who have left behind visible landmarks and scriptural clues. It’s even speculated the GODS of the Heavens may have altered our DNA and evolutionary timeline, making us who were are today. Writing is my passion and speaks out to our foolish ways, thinking we have complete control over everything. Where, in reality, we are nothing more then a small dot in the evolutionary timeline, waiting to be exterminated by the forces of nature, much more powerful then we could ever comprehend. Our historical past is extremely violent, as is our present day. From dictatorship to religious fanatics, its remarkable our human species hasn’t yet been terminated. We are indeed an illogical species, forgetting about the needs of the many and too many of us are self absorbed in the needs of the one. It’s my hope my grandchildren will one day explore the fruits of our universe while building the foundation of their generation into a more stable civilized society expressing the love for others. If not, it’s just a matter of time our species will become extinct, like our predecessors, the dinosaurs. Maybe one day, millions of years in the future, another carbon-based species will find and decipher today’s article, taking heed to the warning signs of our demise. THEM, being an advanced civilization who were nurtured by millions of years of unaltered evolution, they may wonder how these savage human beings ever survived at all. Maybe today, the younger generation will read this article, realizing the fate of mankind, taking steps to eradicate the diseased virus of being self absorbed and begin a brighter future for all of mankind, where freedom is for all, wars no longer exist and the meaning of peace and love is for everyone. It will also mean we must explore other worlds, in order to remove the hardships of Mother Earth, as our footprints continuously places havoc on our planet’s fragile environment. We can be the loving caretakers of earth 🌏 and other M-based planets we visit, realizing our world is a living breathing entity of life, essential to our own well being. We still have a chance to grow into responsibility human beings with the potential to become caring individuals who takes our ‘footprint’ on earth seriously. If not, we may never repair the harm we’ve placed upon on our own beloved planet, we call HOME. And, if so, we don’t have an right to eject our human-virus onto other planets. We are illogical but we can learn to be so much more. Sadly, we have the potential, but never seem to use it for the betterment of mankind. PS If you enjoy my stories please join me here and subscribe for more storylines. If you so happen to be a director or film producer and interested in reading my screenplay BLACK ANGELS – contact me below. It’s indeed a story of how mankind became to be who we are today – Let’s make my screenplay into a blockbuster Scifi Movie. Sometimes I have the inspiration to make a quick poster of an upcoming movie. Alien Covenant is expected to come to theatres in August 2017. After the movie Prometheus, Ridley Scott has decided to continue the triology of Alien. I expect it will be Ridley Scott’s version of the origin of mankind. For those who have followed me on WordPress – Dreams and Reality, you’ll already know of my screenplay, BLACK ANGELS – the origin of mankind, written back in 2003 with rewrites up to 2015. My screenplay BLACK ANGELS first promotional draft is now finished and entered into various screenplay contests, to get noticed by either production companies and/or directors. It’s been my version of the origin of mankind based on archeological findings throughout the history of man. Ridley Scott is the master of film making, but wouldn’t it be interesting if Tim Burton directed BLACK ANGELS. Some of the characters for BLACK ANGELS could be played by Keanu Reeves and Ewan McGregor, for example. Logline: Drug addict war hero seeks revenge for brother’s death, risking his crew in a mining expedition on planet ALPHA XL-420 for the priceless Red Crystal, essential to saving their species from a deadly virus. 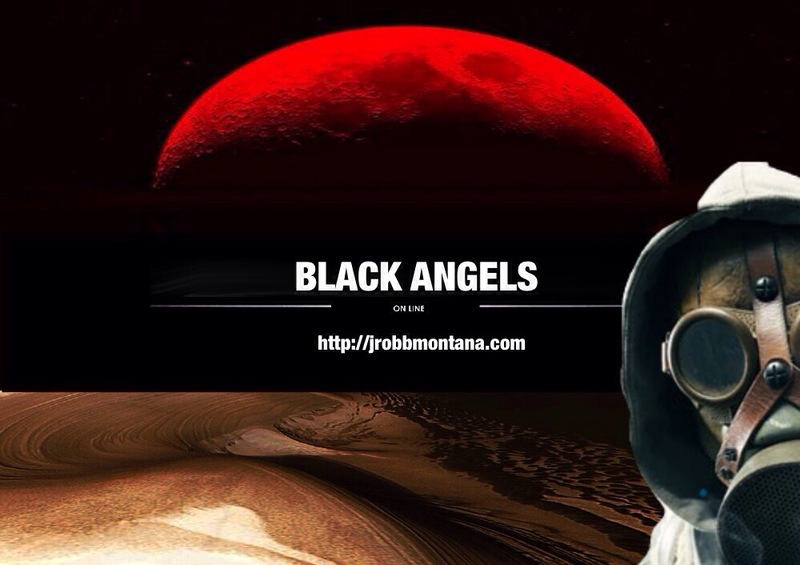 See more of BLACK ANGELS on my website James Montana Scripts. Please follow me on Twitter and Facebook for updates. My last assignment was about developing character outlines. NOTE: My assignments aren’t in chronological order. The order is not relevant in this case. Also, I would like to point out, you too can join in on the free class,” AN INTRODUCTION TO SCREENWRITING UEA (UNIVERSITY OF EAST ANGLIA)” if you’re interested in screenplay formats and outlines, to build a screenplay from the foundation. Please read about the instructors in my last assignment HERE. Carrying on, my assignment today is the Ten Finger or Two Handed Pitch. I’m using my screenplay MISSING UP NORTH to systematically point out the Ten Finger Pitch. MISSING UP NORTH is a drama about survival. A young hunter who wants to impress his peers, inadvertently goes missing from his hunting party, alone in the rugged harsh wilderness. Instead of being the hunter, he becomes the hunted, as a savage Grizzly hunts him down. This story means a lot, because it’s a true story about me, fearing for my life, as this savage beast hunted me down in the heart of the Chilcotin Country. 2. Main protagonist: A young Hunter goes on his first hunting trip with his friend. After all these years, he’s finally allowed to join the hunting party. 3. Goal: To prove he’s capable of pulling his weight and hunting in a harsh environment. 4. Obstacle: He’s becomes lost with knowledge of a rogue Grizzly nearby. 5. Reason of the story : This is based on a true story about me, fearing for my life, completely lost in the harsh unforgiving wilderness of the Chilcotin Country, realizing an ornery Grizzly was systematically hunting me down. 6. Young Hunter heads out on his new adventure, unaware of what awaits him in the next 48 hours. 7. The protagonist has complete trust in his friends judgement, not realizing the consequences of his actions. 8. The young Hunter is faced with the realization, he’s indeed lost. Unaware of the true dangers lying ahead, he’s confronted with the Grizzly, in the most frightening way possible. All he knows, he doesn’t want to die. 9. It’s a true test of survival, racing against the threat of time, the harsh conditions of the wilderness and the impending danger of the Grizzly. 10. Obstacle after obstacle, with death breathing down his neck, the only thing on this young hunters mind, is to stay alive. The brute force of nature against the strong “Will to Live”. In number Ten, I’m suppose to give the conclusion of what happens in the end, but I purposely left it out, because my screenplay is protected by the WGA registration, and most importantly I don’t want to give out the story. That’s what, going to the movies is all about. You can READ more about protecting your screenplay HERE. I highly suggest you do so before screenplay submissions. Please follow me here for a continuation of our screenplay studies and my stories from dreams to reality. Join the FREE program too, if you want to know more about the structure, format and layout of a screenplay. The reason I find this an invaluable source of material, is simply because, I started off as a self taught screenwriter. The only education in this field was my course on literature during two years of college studies at Okanagan College. Believe you me, my first screenplay was a horrendous mis-match of what NOT to do. After sevens years of trial and error of screenplay submissions, I learned the hard way of making a nice polished screenplay. I suggest you take as many courses that you can in the field and of course, when comes along FREE, take it ! I’m taking this screenplay course because of two reasons, first and foremost, it’s FREE and secondly, I’m always checking to see if there’s something I missed. But there’s one thing you can’t change, and that’s the “human preference factor”. No matter what you do, always expect a high rejection rate when submitting your screenplay. It could be as simply as the person who’s reading your story, may not suit the favourable genre agents are looking for. Also, don’t do what I started off by doing. Don’t tackle science-fiction screenplays ,because overall they are considered the most expensive to make in the filming industry. This is why you see most screenwriters who want their scifi thriller to hit the screen, end up making it on their own. They’ll get backers with a lot of money in their pockets, ready to invest in the movie. Myself. I haven’t figured that out. Good example is screenwriter and producer Neill Blomkamp. Born in Johannesburg, South Africa, he pursued his dreams, when his family moved to Vancouver, B.C. After Vancouver Film School, his first break was working on the TV series of the Metro-Goldwyn-Mayer’s Stargate franchise. Finally, he was ready to make blockbuster science-fiction movies (all, which I truly enjoy) such as, District 9, Elysium and his latest, Chappie. Check out his credits and amazing accomplishments! Making a short screenplay about your personal experiences is most likely the way to go. A story that pops out as unique or a real event. Like my screenplay, MISSING UP NORTH. In a recent conference, this past week, sponsored by Nordita, UNC and the Julian Schwinger Foundation, Mr. Steven Hawking and colleagues brain- stormed to clear up questions about quantum mechanics and general relativity. More specifically, they concentrated on the Black Hole theory with a more viable solution then previously thought. As a matter of fact I believe there are countless universes within our cosmic cycle of life and death. In a diagram, if we may, think of a series of oranges (spheres) with each segment of that orange, as its own universe. Now, imagine an infinite number of these spheres, each connected, interacting within the cosmic realm. More interesting, is the magnetic massive black hole in the Northern and Southern Hemisphere, along with smaller individual segment black holes (pinholes). Of course, on a grand scale, each pinhole can easily swallow up galaxies. In turn, the massive Black Hole in the Northern and Southern Hemisphere are colossal mega black holes that eventually (after millions of years) destroy one universe and bringing life to another universe. Good form Mr. Hawking – mathematical theory is relative to a universal understanding of our infinite universes. My name is Bari Demers, presently living in Alberta working on intriguing stories, sure to captivate my audience. Join me on LinkedIn to interact on a professional level. 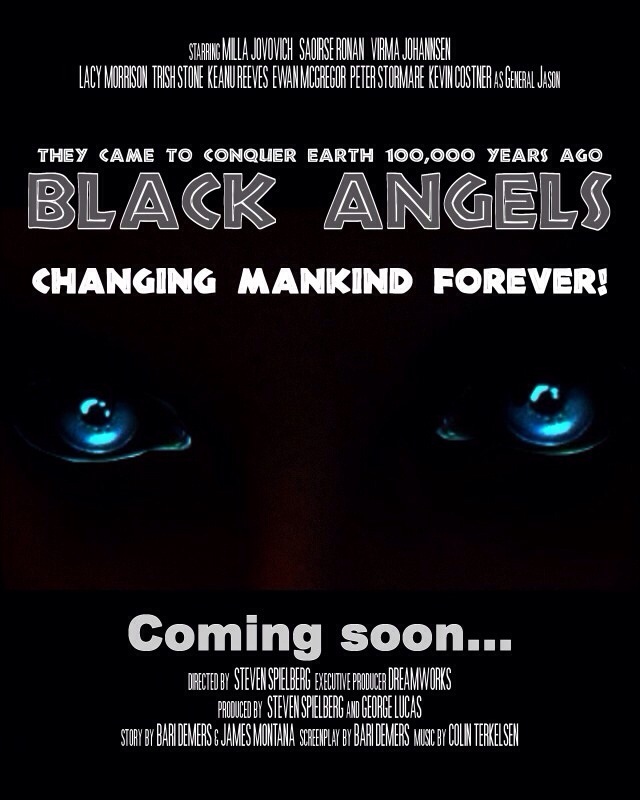 I formed James Montana Scripts to present my scifi horror genre, BLACK ANGELS. Since then, it’s a growing collection of screenplays and scifi stories to hang out and get noticed. The screenwriting program I’m partial to is Celtx. It provides me with an interactive diverse selection of formats, commonly used in the filming industry. AGENT SKY – CIA agent. She’s frustrated with bureaucracy after a lope-hole lets an international criminal walk free, allowing him to illegally trade weapons with terrorists. Her darker side takes over. MISSING UP NORTH – Young Hunter goes missing deep within British Columbia’s rugged wilderness, only to be hunted by an 800 lb Grizzly. My screenplay “Missing Up North – Bloody Survival” is based on a true story around the mis-adventures of 20 year old hunter named Rivers, who went missing in the wild mountainous Chilcotin region by Williams Lake, B.C. for over 20 hours, only to be hunted down by a savage Grizzly. BLACK ANGELS – War Hero Commander Cardin is forced to re-colonize on planet,BLUE EARTH, before their species is destroyed, accompanied by even an darker threat, BLACK ANGELS. A fine blended genre of science-fiction and horror, sure to shake your boots off. It’s based on the Alien theory where,over 100,000 years ago, an intelligent race came to Earth, changing mankind, but something went terribly wrong. This is their story. GAIA – Dr. Zen Callaway, roboticist employed by TEMPRO, family-base colony on Mars. His wife, Christine mysteriously goes missing. Jeremy, Zoe and mischievous robotics feline, Osiris, go looking for their mom. It’s a family orientated story, Dr. Zen Callaway is a top roboticist working for his employer, Trillionaire CEO, Mr. Wiseman of TEMPRO Industries (Terraforming Engineering & Mining Resources Operations). He convinces his wife Christine and his two children to embark on a new adventure, living on Mars, a new family-based colony. After his wife Christine goes missing in a mining mishap, his two kids Jeremy and Zoe are determined to find their mom by the help of a mischievous robotics feline named Osiris. The adventure turns up more than they expected leading them to the darker side of Mr. Wiseman. Even though screenplay, BLACK ANGELS requires CGI visual effects at a higher budget, it’s a perfect fit for the movie screen and may entice major production companies. It has the potential to becoming a blockbuster trilogy. Whereas, my other screenplays are formatted for indie films, with a smaller accessible budget. I hope you enjoy my screenplays and find them intriguing. 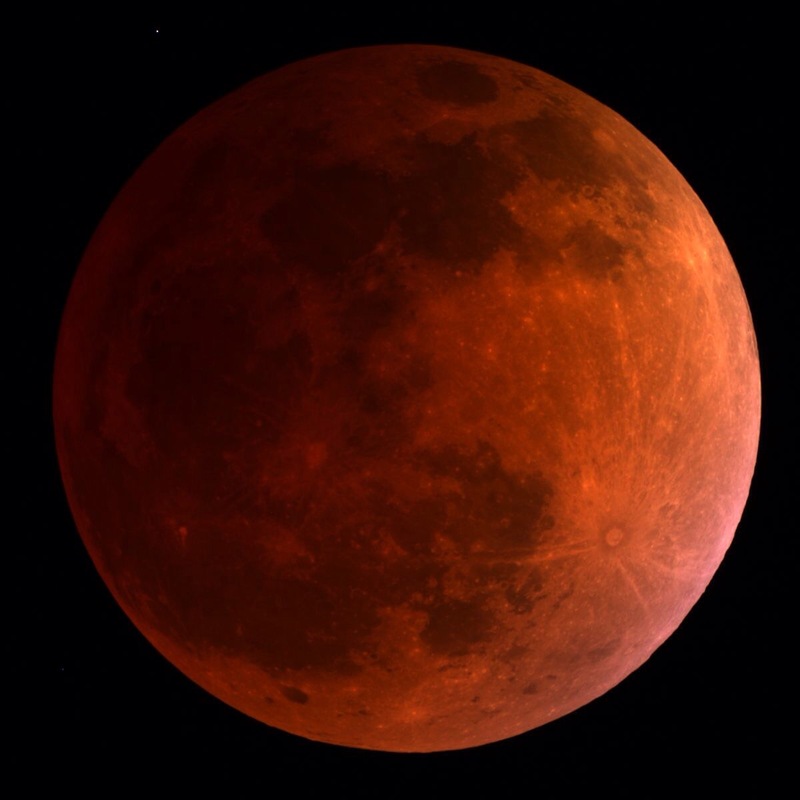 Come join me on Twitter if you love science-fiction,horror, anything NASA and my past time Vegas. My elevator pitch is how I’m going to explain my screenplay (Black Angels) within a two minute span, sparking interest with my viewers. But first, I must captivate their interest in the first 30 seconds. Let’s pretend I’m being interviewed by Steven Spielberg. I now have 30 seconds to capture Mr. Spielberg attention, or he will kindly usher me out the door. STEVEN SPIELBERG: Welcome to Dreamworks Movie Studio. Please, have a seat. I hear you have an interesting sci-fi screenplay called BLACK ANGELS. Go ahead and tell me about your script. ME: I’m writing a science-fiction thriller set 100,000 years ago, where an intelligent civilization are forced to leave their dying home, Sirus 5. It’s up to an elite military team to get a newly found planet, ” Blue Earth” ready for colonization. STEVEN SPIELBERG: So, what makes this sci-fi any different from others? ME: Black Angels is based on a Historical Event Theory, Mankind’s evolution was jump-started by an intelligent race (known as the SIRIANS) from the Sirius Cluster, crossing their genetics with ours. They were believed to be the missing link, making us who we are today. STEVEN SPIELBERG: What problem or problems are you trying to solve? ME: Our reluctant hero, Karen Jefferson must carry out the mission so her people can colonize earth before it’s too late, while trying to overthrow their revels, the Jotunns and an evil force lurking throughout earth. What happens next is horrifying, changing mankind forever! STEVEN SPIELBERG: So, Karen is the main protagonist? What is the obsession that drives her? ME: Karen is emotional torn between her irrefutable love for Commander Cardin and her mission to help her people colonize before her home planet is destroyed. But the Jotunns stand in her way and to make it worse, the evil force causes chaos. STEVEN SPIELBERG: It sounds like the main antagonist are the Jotunns. Who are the Jotunns? ME: The Jotunns are a Reptilian revile enemy who cause havoc, but are not considered the main antagonist. Their main antagonist so happens to be the evil force lurking planet earth. And there’s a twist to the overall plot, which will change the outcome to our story. STEVEN SPIELBERG: Excellent, sounds like an interesting story, but what makes it different from Aliens or Prometheus? ME: Black Angels is based on a real theoretical historical event that actually changed mankind into who we are today. It’s base on ” The Gods of the Heavens” Theory, whereas Aliens and Prometheus are fictional accounts based on an evading host. 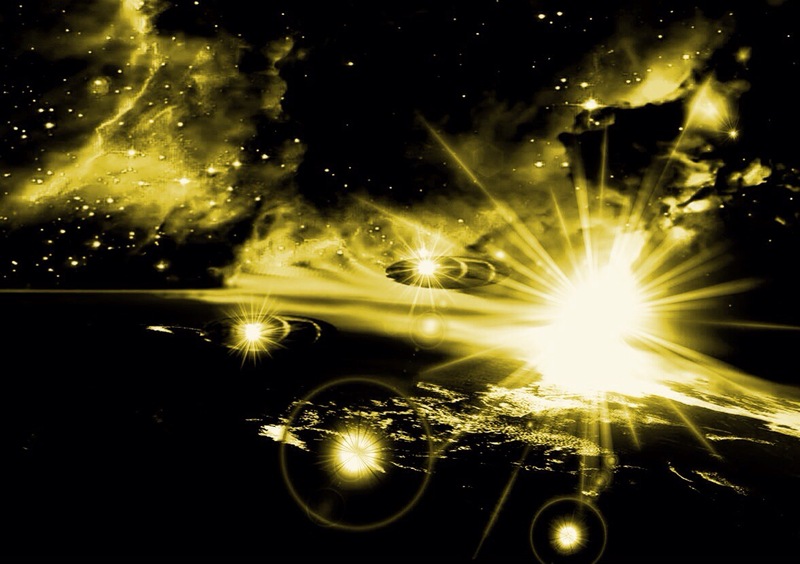 The Gods of the Heavens even take us to our present day of UFO events. So, in theory, my screenplay can lead into a trilogy of science- fiction stories. STEVEN SPIELBERG: Is Black Angels a cost effective movie? ME: Yes. With the use of CGI visual effects, Black Angels can become a budget based movie. We can even trim the characters, if need be. STEVEN SPIELBERG: Do you have a Synopsis ? STEVEN SPIELBERG: Great. We’ll get in touch within you soon. Thank you for coming. ME: Thank you for this opportunity. I appreciate your time and it’s wonderful to finally meet you, Mr. Spielberg. I know this may sound cliche, but I have been interested in your movies ever since I saw JAWS, ET and Close Encounters of the Third Kind. And so, that would be end of your elevator pitch, but not necessary the end of your screenplay. With the funds collected, the project may even be the next blockbuster movie, BLACK ANGELS. I have enjoyed all of Steven Spielberg’s movies, including Jurassic Park, Indiana Jones and the Raiders of the Lost Arc, War of the Worlds (saw the original movie when I was 8 years old) and other favourites, such as The Goonies and Hook. One of the most dramatic movies I watched by Steven Spielberg is the historical drama, the Schindler’s List, a 1993 classic film scripted by Steven Zaillian, based on the novel Schindler’s Ark by Australian Thomas Keneally.